This week, during his State of the Union address, President Trump condemned policies that prioritize family connections in decisions about who is allowed to immigrate to the United States from other parts of the world. When this priority was established by the 1965 Immigration and Nationality Act, it explicitly emphasized close relationships and uniting family members. In 2018, the President and those who oppose immigration, legal and otherwise, started using the phrase “chain migration” in a bid to start shifting public opinion on family migration. President Trump and the authors of the RAISE Act propose major restrictions on family-based immigration policies. Rather than family-ties, they say the primary criteria for entry to the U.S. should be merit, or high skills. Since 2010, immigrants from Asia have entered the U.S. in higher numbers than immigrants from any other region. And they have done so primarily through preferences in immigration law that favor reuniting close family members. 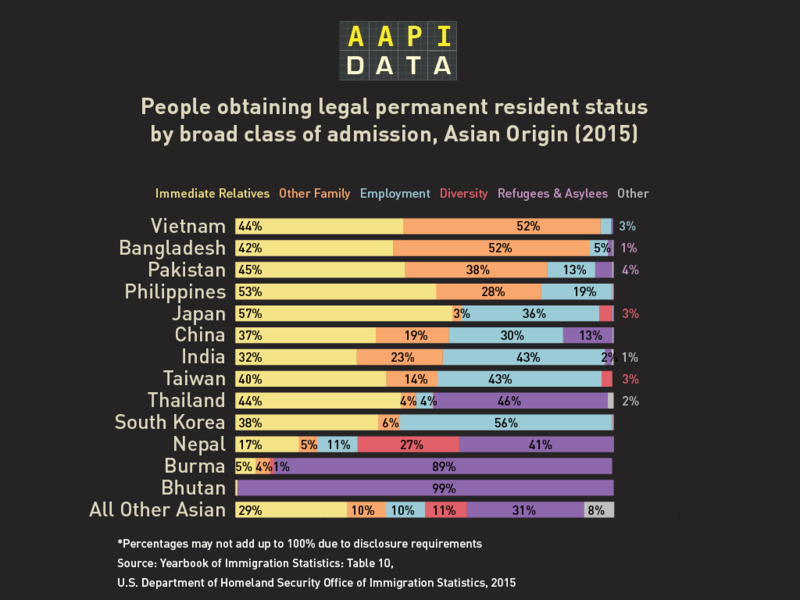 For example, prior work by AAPI Data has shown that 55% of Indian immigrants who established lawful permanent residence by obtaining a “green card” had been admitted to the U.S. because they already had family in the United States. About 40% of Indians entered through an employment- or “merit”-based visa. Among Chinese immigrants who obtained permanent residence in 2015, a clear majority did so through their ties with a family member’s sponsorship and only 30% received employment visas requiring specialized skills and high levels of education. While immigrants from India and China are the most likely to receive “merit”-based visas through employment based preferences, proposed legislation by Republican members of congress Tom Cotton (R-Arkansas) and David Purdue (R-Georgia) would eliminate a major pathway to immigration for those from Asian nations. The Cotton-Purdue bill would maintain the ability of family members to sponsor their spouses and minor children, but no longer allow them to sponsor siblings or adult children. Parents would be allowed to obtain visas, but only for temporary stays. 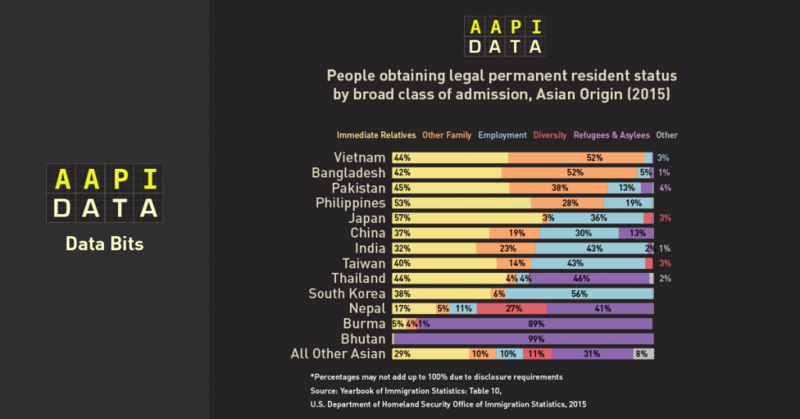 In 2015, fully 20% of Indian and Chinese obtaining legal residence did so through family-based preferences in immigration policy that would no longer exist under the Cotton-Purdue plan Trump has endorsed. The Cotton-Purdue legislation would also give preferences to those who speak English proficiently (another mark of a “good” immigrant for the bill’s sponsors). In 2016, more than 60% percent of Chinese immigrants claimed to be limited in terms of their English proficiency. Which brings us to the ideological heart of the debate over “chain migration.” Cotton and Purdue have framed the debate as one over preferences for “good” immigrants who enter the U.S. based on employer-sponsorship, education, and technical skills versus “bad” immigrants who enter the U.S. based on characteristics other than merit (such as family-based sponsorship). But a focus on Asian immigrants shows even for a group that is most likely to receive employment-based visas, this is a false line to draw. Yes, many enter because of their high levels of education and skills, but the majority enter due to family-based immigration preferences and many do not speak English fluently. Although the debate over immigration tends to fixate on immigrants from Latin America, the fact is that most people of Latin American heritage are not immigrants. This is not true for Asians in the U.S., a majority foreign-born population that benefits from what Trump last night again called “chain migration” and who are disproportionately affected by proposed limits on family-based preferences in immigration policy.